Gatsby gets a run for his money with the newest knees-up to come out of Slide’s production house. 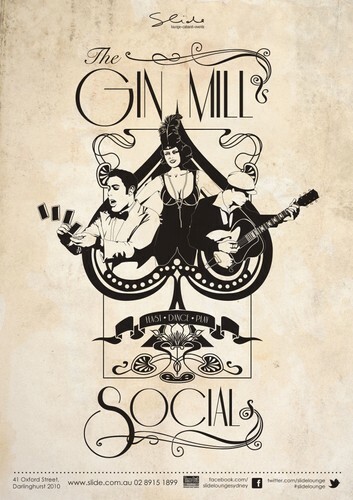 Taking inspiration from the roaring 20’s speakeasies and juke joints, the Gin Mill Social is a lively and lavish dinner-party where your friends and family come together. Head Chef Aymeric Saint-Lannes, has created a special menu inspired by the speakeasies and hotel banquets of the 1920′s. Multi-tiered food platters and share-plates of many delights; eat as much or as little as you like. Set to be the hottest spot on the block in 2013, ticketed entry for dinner begins at 7pm. Free entry after 10pm for swing dancing on the ground floor, or perhaps a flutter or card trick on the mezzanine level Whisky Bar. With seamless entertainment and generous food options for all tastes, accompanied by a quartet band playing beat jazz and jump swing, the whole evening is casually elegant and totally stylish. Perfect for any group occasion, birthday, anniversary dinner, meet with the in-laws, hang with the outlaws, or simply to reconnect with old friends in the multi-level setting of Slide Lounge. The live music and performances will surround you while you feast, dance and play. Dresscode: Speakeasy. Girls in pearls. Guys in ties.